Lightweight for tropical voyages, or for hot days at the renaissance faire! 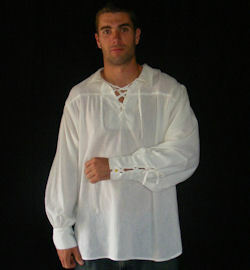 The Elizabethan Sea Dog Shirt features a yoke with turn down collar, lace-up neck and lace-up cuffs. Our sailor's shirt is crafted in a natural, ivory cotton fabric.